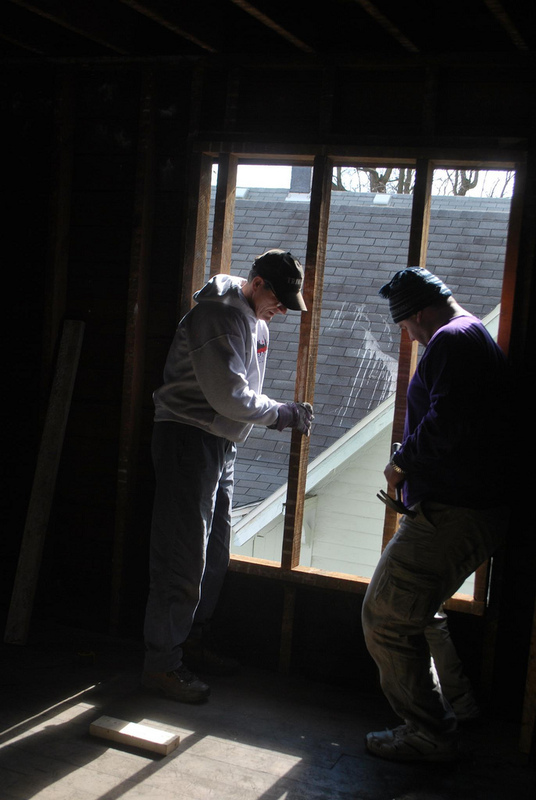 Rick Ridenour (left) replaces a window. By Chris Meehan and Sean Connolly. Photos courtesy of Bill Sjoberg. 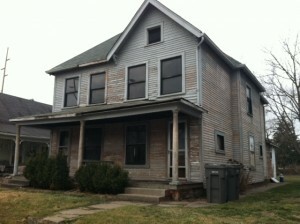 This house on Union Street is undergoing major renovations. Bill Sjoberg (northern Virginia) organized the trip for a group of branch members who shared a strong desire to see the community’s work in Indianapolis firsthand. “The work was more physically strenuous than a lot of us were used to,” he admitted, “but where else can you get so tired and filthy and love every minute of it? 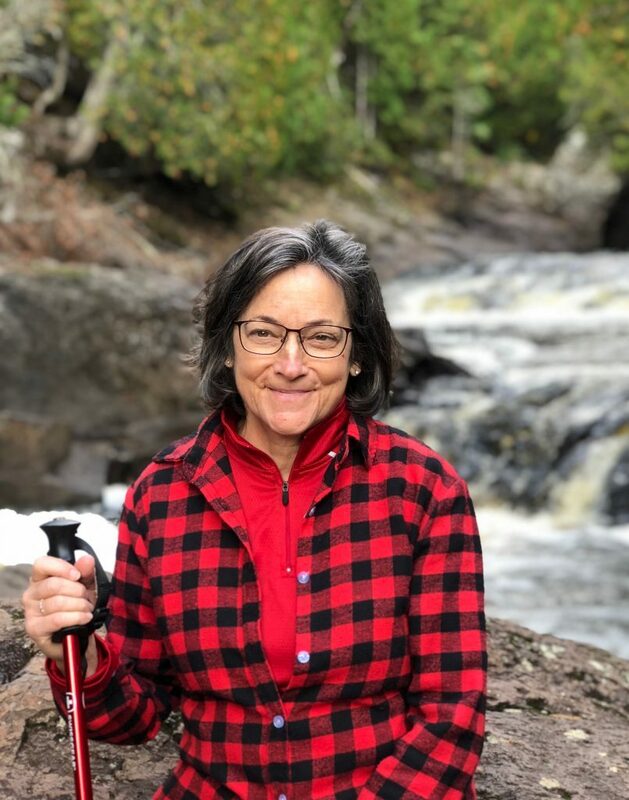 We were sore at night, but we were all talking about wanting to come back and do it again.” The group spent months planning for the trip, with members carefully arranging their work schedules to make travel possible. Northern Virginia branch members were joined by members of the Indianapolis branch, college students from the Triangle, South Side residents and a few visitors from Evansville. “Everybody I met, interacted or worked with had the same spirit--a warmth that radiated from them, a sparkle in their eyes. It gave me energy throughout the day,” Margaret said. 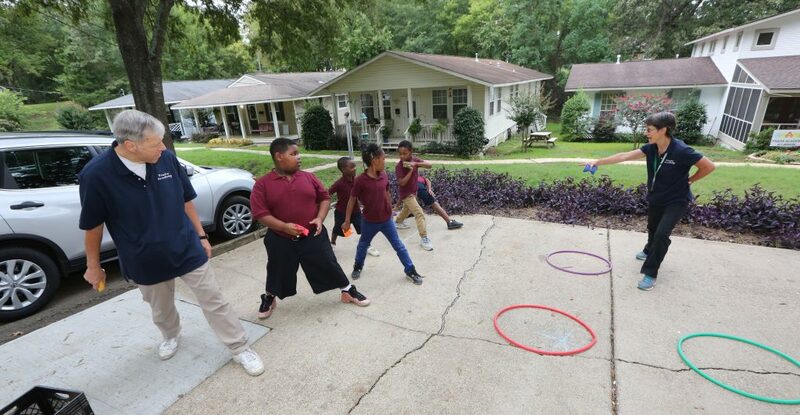 During their down time, volunteers participated in an open house with South Side neighbors. They also visited the campus division in the Triangle area of Indianapolis. They attended the annual Action fundraiser, a dinner, dance and auction sponsored by the Indianapolis branch. (The dance netted $5,000 according to Mark Sklorenko, who was responsible for the event's finances.) Walt and Pam Seale, who used to live in northern Virginia, organized hospitality for the trip and arranged the schedule. Volunteers stayed in the Triangle and in branch members' homes. The house is being remodeled to accommodate a large household. Plans call for a large living room and a dining room that faces a wide-open backyard that can be shared with neighboring community households. The floor plan was designed with flexible spaces to enable lots of hospitality. 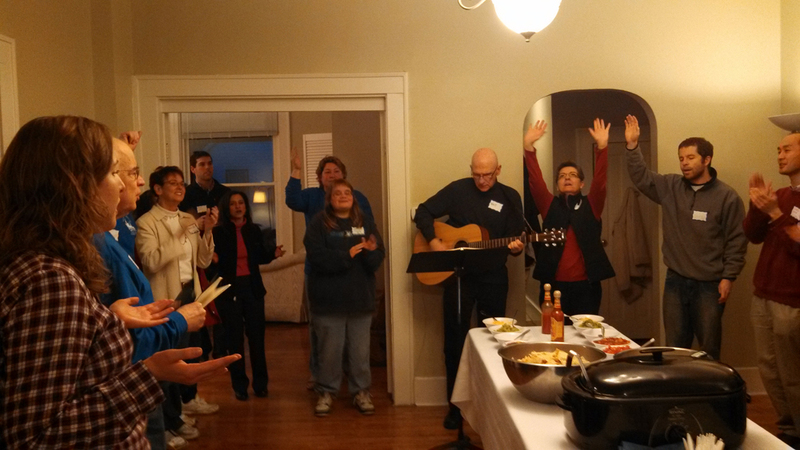 Volunteers from northern Virginia participated in a prayer meeting on the South Side. David Smedburg, who recently came underway in the northern Virginia branch, joined the team to serve and to learn more about the community. He was particularly happy to learn about framing while working with a professional contractor and brother in his branch, Steve Forbes. He said he also appreciated the daily morning prayer and fellowship time on the trip. Glory! we were so blessed to have our brothers and sisters join us and work alongside us. It really increased our joy! thank you, NoVa! Awesome and encouraging news blast! What tangible, real work was accomplished with the help of volunteers from our NoVa branch. May this service trip be an inspiration to all of us as we discover more ways to share life together in the whole community. I'd like to know more about the dinner dance and how the branch pulled off a $5000 net on the fund raiser, thats huge!! Glory! NOVA group, you are an inspiration for all of us! Way to think outside the box and plan this trip! Great News. It is so encouraging to here how much work was accomplished in one short week. Thank you God. Praise and Glory to our God! 15 adults toiling, sharing real life, working 400 hours, praising our living God! This story touches my life deeply! Onward Christian Soldiers! Terry, it was a formal evening with the food prepared by volunteers from their homes, the menu planned by the branch, and the food cost covered with proceeds from the fundraiser. There was a $35 ticket per plate for everyone, and 200 raffle tickets were sold in the months leading up to the event, at $25 each, raffling off some nice items and vouchers. Many friends and co-workers were able to buy raffle tickets without making it to the event, and the advertised limited number of tickets was also good motivation for people. One of the prizes was actually a portion of the raffle sales. It was so great to have NoVa there with us! What a gift from the Lord and from them!